BRANDING DESIGNS: Futura is a boutique-like workshop that seeks to redefine the Mexican design values, maintaining functionality, wit and charisma. It was started in the year 2008 and currently their headquarters is in Mexico. They are into branding designs, software development and film production and they have many clients around the world. VR Fest was the first virtual reality festival conducted in Mexico, which was a combination of both art and technology. 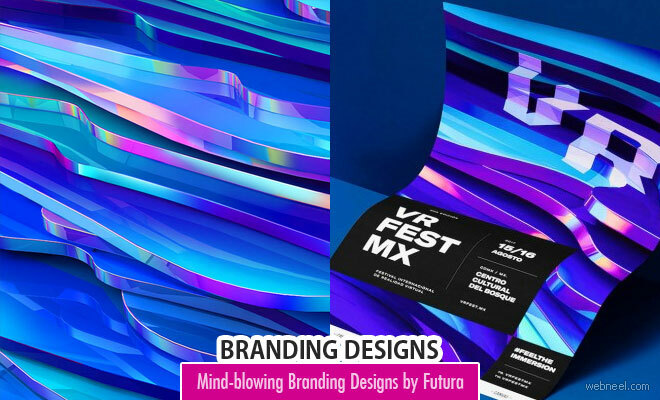 VR Fest collaborated with a branding design studio - Futura to create identity designs for the festival and the result is mindblowing. While making such branding designs, new processes and software were used to create volumetrics which were intended to represent beautiful physical environments around the world, such as Vietnamese rice fields, the Brazilian-Argentine Iguazu waterfalls, and the mud volcanoes in Azerbaijan.